It looks good from a distance, it provides you a feeling of comfort, it keeps you relaxed for a duration. It tickles you, giggles you and then swallows you completely. 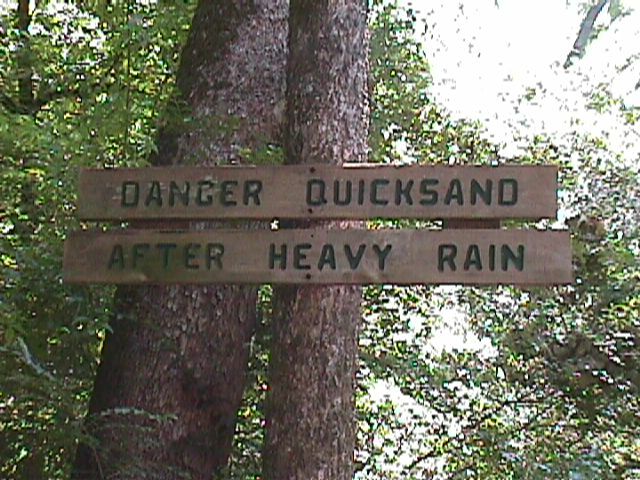 Its Quick Sand – Lets understand it, get over it and always be prepared. How long its been for you to cherish your work while you try to get yourself into the bed at night? At least I have spent many sleepless nights and a fearful days whenever I think of what I lost today – not working on something exciting or something that added another gem to my profile. Playing safe and taking no challenges may soon drag your feet into a quicksand of rotten skills and professional emotions towards day to day job. And, that is what keeps me on my toe, do something new, experience something new, as exciting as your first job. And feel good about it. Its not something new, in fact, this is the story of every second person in a multinational organization primarily the so called “L5 companies” – Start ups do well on this front. What do you think can we do to save ourselves from this quicksand of 9-6pm time window? I call it the human maintenance window. Because, this is the time window in which you need to fix your self not only as an individual but also as a professional. But how do I patch myself with the latest? I think, the answers are within our own self. But before that, we got to ask ourselves a few more questions – Take a pause and think about the question before you head to the next one. Does the new Job has something exciting for me? If your answer is no, then how can I react to it, so that I may infuse an innovativeness which can boost up my interest. If yes, then am I really working on it? If the technologies are old but the domain is interesting, can I still spend time on technology by maintaining the balance between the techs and specs of the domain? Trust me, very few are doing this and climbing up the ladders really fast. Are you too bothered about your manager than your peers? You need to brighten up your soul buddy! Its always good to have nice peers than a great manager. Remember there is a difference between a Mentor and a Manager. Hardly people find Mentors in Managers or vice-versa. If you have one – you are the lucky dog! What does growth means to you? Money Or Position. I may not be able to talk too much on this one, as its too debatable and no one is wrong on his part. However, I just know one thing – there is always “a limit to everything!”, beyond which, what may keep you happy is the work you do and your passion to love what you do. If you’ve answered these questions open heartedly, then you are good to get out of the sinking state. But if, you have just read through and not read between the lines, then may be you need more sticks and support from outside. So don’t let it loose – you can still follow your heart and wait for someone to pull you out of the sinking sand pit. A very old saying “Opportunity strikes when you are least prepared”, is the one damn haunting line for me and so I am always trying to fight it. The bigger question for you is – Am I? …need some Introspection to help come out of a cocoon. Embracing my failure has taken me a while but the more I thought about it, I realized that I learned more from that failure than I would have had I been successful the first time around. After having spent a sleepless night over it, the elements of which I’ve been obsessing about and researching for more than a few days, I found I couldn’t tie them together into a cohesive vision. Without a vision, there was nothing to articulate which results in a failure; and in a way that I found disappointing after spending so much time thinking of ways to tie the elements together, coming up with a strong vision. I am really not sure still if I just over-thought something or was that I was bounded by the whole concept of audience buying the idea at the first place. No matter what it was, though I could not completely impress the audience, am still sure I would once I do my homework not only well but in an organized fashion. I was just playing a game called “Angry Birds” today and realized that if I clear a stage in one go, I was starting to hate the game because it felt so easy. For the next stage, I tried and tried but failed, however, that again made me realized I was learning the game better because I did not picked up the “angles” to hit the pigs which resulted in a low score. I nailed the stage on my close to tenth attempt but that gave me much more pleasure than winning the first stage with least amount of efforts. Overall learning is a bit more than reading, understanding and experimenting which my school and college taught me, sometimes the trial and error mode is a much better option to know and understand the “survival of the fittest”. So from that point of view failure is just an expected evolution towards building a more absolute understanding. Each consecutive failure only exposes strategies that have not worked for the individual, helping individual avoid the same pitfalls again and again. I seriously think we should be learning from our mistakes, because its only “I” who knows what “I” did wrong. I still have hope that I influx some thoughts into the fresh young blood before they lose their appetite to challenge their capacity of doing great things and digesting and learning from their own mistakes which forms the stepping stone to the next big achievement. Wow this reminds me of a stronger idea and I am as always, optimistic it would fly this time. Software Engineer – Are you sure? This is my first blog to share my thoughts and thought process with the talented Engineers and IT professionals out there. I was around 10 years old. Though I still recollect those words through the misty memories of my old-school, “Okay.. so you did not learn the definition of a computer.. But at least tell me something about it!”. And then a voice breaks up the silence from a long pause to say, “Teacher… May I…”. Oh hell, not again Mr. Dictionary. I was given examples of how Mr. Dictionary always used to do his homework in time and almost mugged up the complete dictionary (may be with page number) to impress my teacher and other audience like that of me. I realized, there was something more to Demand (Questions) and Supply (Accurate Answers) in an ever-changing world. What if I do not learn the definition by heart but I understand what is it and how can we make efficient use of that entity to suit our needs. It is quite possible I can still impress the intended audience. I see a similar structure of neurons interactions in need to understand the ever-changing technology stack. Most of the times the technologies are quite related to one another under the different names in fact under different roofs (Vendors) altogether. I will next be talking about a breed of homo-sapient-sapient which are not software programmers or developers but Software Engineers. I do not intend to brush the wrong way but for me Software Engineer is not the one who has a degree of B-Tech or BE from a reputed college. One has to justify it to himself deep down his heart is he is really an engineer? Or is he busy following a tech guru in his company or otherwise and doing the boiler-plate-coding to gain momentum in his career. While I learned about Spring API, I often asked my self, why didn’t this idea came to me first. And then one day I got the answer… I had just been too much of a programmer and not an engineer and had hardly been asking my neuron team to work on weekends :) . To sharpen your skill, you need time and this 4th dimension is just too costly to spend. So just to tie things together, my Teacher was absolutely right when she said “At least tell me something about it…”, giving me an opportunity to frame a definition m self from my own understanding . One has to cope up with the ever changing technologies and environment around you and for that you just cannot be a programmer (from my context, Mr. Dictionary) you have to be an engineer and soon you would realize that you have started putting the pieces together in the back of your mind for any new technological advancements in the world. So lets just not cram up a technology to complete a task in hand but learn it for you want to define it your own way to the lay man. Trust me, may even be able to – “tell something about it”.